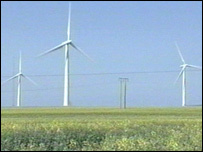 Planners who want to put up a new windfarm in the east of England have met with opposition from villagers. Suffolk-based Your Energy has proposed placing 16 60-foot-tall wind turbines off the A14 near picturesque Boxworth, in Cambridgeshire. But some residents in the village of 300 people say the turbines would be a noisy blot on the landcape. The firm is to hold a consultation meeting next week before putting forward a planning application. Jeremy Nichols, a member of the Boxworth Planning Committee, said: "We think it is absolutely outrageous that anyone should contemplate such a massive intrusion on our environment." He cited "pollution of our environment, sound pollution and health risks" as major concerns. John Fairlie, senior development manager for the firm, said he was looking forward to dispelling some of the villagers' concerns at a public exhibition at Boxworth Village Hall on 19 May. He said: "I can understand there will be concerns, especially before the exhibition, and we hope to address those directly and also share our assessments with the community." He said Your Energy had studied possible visual effects of a wind farm on the proposed site, the archaeology of the area and background noise levels. "The wind farm would not be a noise nuisance", he said.